Jeered from the second he walked off the bus at Old Trafford, Angel Di Maria was centre of attention as his two assists helped Paris Saint-Germain to a 2-0 win in their Champions League last-16 first leg. Di Maria, who had a beer bottle thrown in his direction in the second half, drank in the criticism from United fans, many of whom have not forgotten his disastrous spell at the club in the 2014/15 season. That year was Di Maria's only since 2008 without a trophy; just three league goals and a £60m price tag made him the symbol of a failed regime at United under Louis van Gaal, but Tuesday night only served to remind Old Trafford what they should have had. On the pitch, the Argentine was slow off the mark. PSG struggled to bring Kylian Mbappe into the game, without the injured Edinson Cavani stretching United's defence, and Neymar being Neymar. But late in the first half, Di Maria's end was up. With the ball rolling out for a throw-in, Ashley Young barged into his back, sending him flying into the hoardings via the steep slope that frames Old Trafford's pitch. 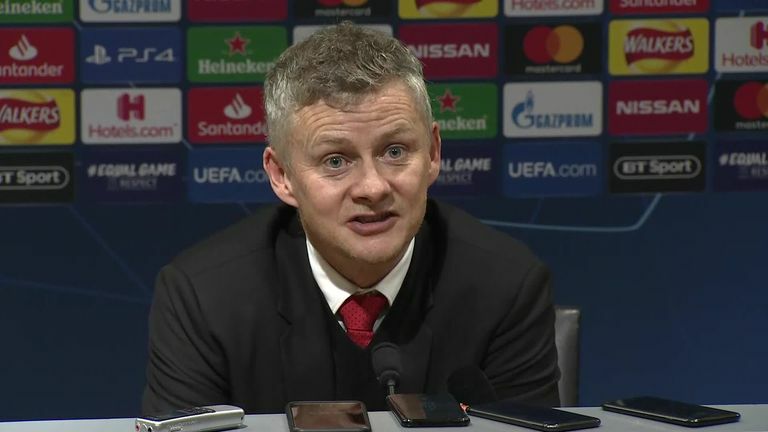 Ole Gunnar Solskjaer says Manchester United were given a reality check by Paris Saint-Germain as they lost 2-0 in their Champions League last-16 first leg. Di Maria, of course, made the most of it and held a seemingly injured arm as his team-mates surrounded Italian referee Daniele Orsato in a desperate attempt to force a second booking on Young. No yellow came, but the stick kept coming. Di Maria cupped his ears to his former supporters as play resumed, and that seemed to bring the 30-year-old to life. After the break, his deep corner to the far post should have been dealt with better by Nemanja Matic, allowing Presnel Kimpembe to convert, but the assist for PSG's second was superb. Collecting the ball wide left, Di Maria's perfectly-weighted centre left Mbappe with no option but to score after the Frenchman had burst past an unknowing United defence. Then came the showboating, and plenty of it. A particular moment in the right corner of the pitch with Mbappe, with whom he teamed up to twist and turn the United defence inside-out, was met by huge cheers from the travelling support, and more anger from the home crowd. "Angel Di Maria is very competitive. If you tease him, it does not make him weaker," said his manager Thomas Tuchel, summing up his contribution perfectly, even noting Di Maria's weak start to the game as he won just one of his nine duels. Di Maria was the architect for PSG's victory, which will only further rile those who remember his failed United stint well. This was the Di Maria £60m was supposed to buy.